FADOS multifunction circuit board testers have been specially developed by ProT Ar-Ge to determine and troubleshoot faults at all type electronic circuit boards. They are basically computer based VI testers. The Fados 7F1 which stands for FAult Detector and OScilloscope 7 Functions in 1 . FADOS 7F1 can be used for determining faults of all types of PCBs present in Electronic devices used in medical, textile industries, Electronic Appliances and other large automated devices used in the Automobile Industry as well. It can also be used as a component tester for IC, transistor, FET, IGBT, resistor, capacitor, indicator.FADOS7F1 is a double-channel VI tester. 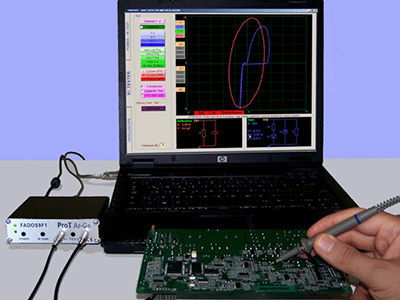 While using TEST feature, a comparison can be conducted without giving energy to the card; while using OSCILLOSCOPE feature, energy is given to card and signals are controlled. Scan mode: Manual or automatic. Automatic selection steps of Voltage, current, frequency. Connections: Probes can be connected to each socket. Yellow ring Probe indicates channel 1; blue ring probe indicates channel 2. The crocodile probe is the common terminal.